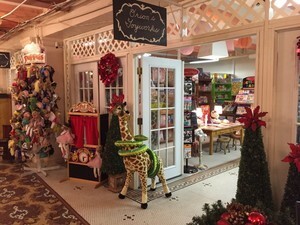 Orions Toyworks is located within Castle Inn, in Delaware Water Gap. It occupies part of the space where the bowling alley once stood. It is an owner-curated toy shop that takes pride in finding toys that bring joy to "boys and girls and children of all ages". Most of the things you will find on the shelves have been suggested by, or given the thumbs up by, our grandchildren and not available in big box stores. We seek to showcase items that stir curiosity and provide a learning opportunity. Because we are lucky enough to be on the edge of such natural beauty and geologic splendor as the Gap has to offer, we feature a "nature nook" with rocks, and minerals, arrowheads and geodes. Looking down off the shelves are stuffed animals one might espy in the great outdoors: deer, beaver, raccoon, snakes, etc. Also standing vigilantly nearby are our hand-crank powered, animal shape flashlights, as a gentle reminder to adults and children alike, to pay heed to the environment. a) The Gap is known for its wealth of musical talent and annual jazz festival. Orion's has a small assortment of musical instruments or toys for children. b) The Gap is noted for its art, -- its beautiful landscape having sparked interest in painting through centuries of awe inspired visitors. The store has an art center giving children the opportunity to test out their talents with some of the large array of sticker, coloring, and activity pads available for sale.-- while sitting at a vintage childrens' library table purchased from a family that has resided in the Gap for generations. And if the children should want to take a peek at what the grown-ups are doing in the world of art, they can skip to the next-door shop on the Colonnade, the Castle Gallery, featuring a changing exhibit of local artists' works. c) The Gap was a major stop on the railroad, the reason that it was so accessible to tourists. Delaware Water Gap was second only to Saratoga as a tourist destination on the East coast. Several times a year, old steam trains still travel the rails and stop in the Gap. Orion's has a nice assortment of Melissa and Doug wooden trains, tracks, and train sets. We try to be accessible to all families and have toys in every price range from $1.00 to $150.00. Lastly, we sell children's tee-shirts and donate 100% of the proceeds to St. Jude Children's Research Hospital.